24 Carrot Island — That’s right, this Pop Original island has arrived at Poptropica Worlds! 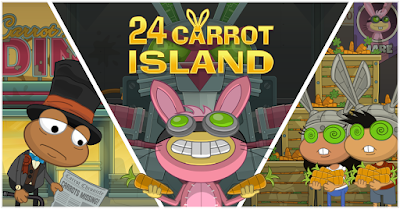 24 Carrot Island has been remastered, and it’s better than ever. The town is looking for a hero and I’ve stepped up to the plate, but in need of some backup! Embark on this adventure with new twists and obstacles to save the citizens of 24 Carrot Island! Uncover the mystery of the vanishing carrot crop and navigate the secrets of the Carrot Factory to stop the evil mastermind, Dr. Hare, before it’s too late! And for all you experienced Poptropicans out there, don’t be fooled by this familiar quest! There are never-before seen characters and new, tricky obstacles to investigate that are sure to keep you guessing.